Book chain Waterstones has been bought by activist investment firm Elliott Advisors for an undisclosed amount. James Daunt, the chain's chief executive since 2011, will remain in the post under the new ownership, along with his key management team. Mr Daunt said the sale should mean the chain could grow a lot faster. Waterstones has 283 bookshops and 3,000 staff in the UK, Ireland, the Netherlands and Belgium, and sales of more than £400m a year. 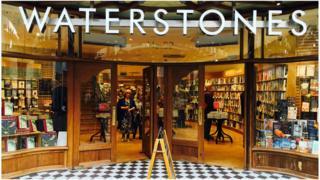 Lynwood Investments, which has been the controlling shareholder in Waterstones since 2011, will keep a minority stake. Lynwood boss, Marina Groenberg, said she was "very proud that the business has been restored to profitability and good health during our ownership and thank James Daunt and the wider management team for delivering a successful turnaround". Hedge fund Elliott has about £35bn of funds under management worldwide. It has earned a reputation over 40 years as a no-holds-barred activist investor. The firm famously pursued Argentine debt for more than a decade, seizing one of the country's naval ships while it was docked in Ghana and prompting the country to default. More recently it bought a 6% stake in Whitbread. Elliott wanted Whitbread to split its coffee chain from its hotel business to improve shareholder value, and this week Whitbread announced plans to do just that. However, Mr Daunt told the BBC that Elliott was buying Waterstones as an investment which would grow, not in order to force through change. He said he expected Elliott to "see us grow and ultimately sell us for a nice profit - that's what private equity people do". Mr Daunt said Waterstones was opening more shops at the moment, because the retail downturn was leaving empty space in desirable locations which the book chain could snap up. Normally Waterstones aims to open about 10 shops a year. However, investment from Elliott combined with greater availability of store space meant he expected the chain to open "a lot more now". Richard Lim, chief executive of Retail Economics, said that back in 2008 the "writing was on the wall for Waterstones". The shift to online and the impact of rivals like Amazon meant they had been operating in a part of the market under "significant pressure". "In the last few years they've managed to turn around the business through the good work that James Daunt has put into it," he said. Changes included making a store visit into more of an "experience" by opening coffee bars and inviting authors to give readings. Mr Lim said Waterstones had attracted a buyer because the chain had "come out the other end much leaner and more flexible" and was now a profitable business.